Generally, office is a workplace or a room to work administratively. Not only at the office, you may also need to do your overtime work at home. Surely, whatever job you do you need a computer and workspace at your home. Don’t discourage if you have no wide space in your home. You can utilize your small space to work which is usually called home office. How come? So, let’s check these inspirational home office ideas for you. Usually, the existance of stairs in a home remain unused space understairs. You can utilize the space to be a home office. Place a small black table contrast with white chair, and cabinet. It’s a very creatice design of double desks to place your computer and stationeries. You may also need to archieve your printed documents and books to look orderly. This design is fit for your need because there are three useful baskets on the shelves. When you still have enough space on the corner of your bedroom, you can make it as your private home office. Maximize the space by designing letter L desk and shelves. As you can see on the picture that the table is designed to be folded when it’s not in use. The design is fit for small space in your home. However, a simple home office is best for small space in your home. The design of the desk and the cabinet is so beautiful and useful. To make a comfortable home office, you don’t have to design it permanently. Sometimes, you need to be moved your desk to other sides or rooms. So, you can create this portable home office for you. 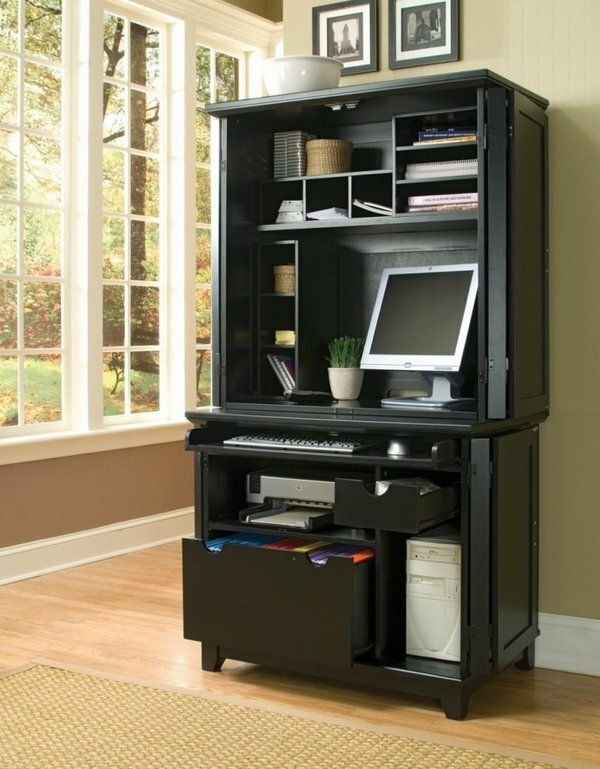 Other ideas to create home office is a design with two purposes. When you need to use your computer, it will be your desk. When it’s not in use you can place the computer and CPU inside the cabinet. The room will look clean, tidy, and wide. It similar to the previous ideas that is a design with two purposes and functions. The hinge is solid enough to support the board to be a desk. Otherwise, it functions to close the board to be a cabinet. A design of combining desk with shelves is a smart idea to create a cute home office in small space. Besides, giving color touch will help you to be more excited in working.These are several designs for girls who love ice cream color. It’s so adoreable! To maximize the utilization of small space in your home, you need a special design to place computer, files, and books in one set. The design on the picture is also portable to be moved everywhere you want. It’s so efficient to use small space.